FireCore team has come up with a PwnageTool like program to build custom jailbroken .ipsw files for your second-gen Apple TV. Like almost all jailbreaks for iOS 4.2.1, Seas0nPass jailbreak is also limited to tethered-boot for now. Currently the jailbreak for the 4.1.1 (iOS 4.2.1) software is ‘tethered’. A tethered jailbreak requires the AppleTV to be connected to a computer for a brief moment during startup. All download links are posted at the end of this article. Step 1: Download and launch Seas0nPass. Step 2: Now select “Create IPSW” option to build your own custom jailbroken firmware for Apple TV. Step 3: Now wait for Seas0nPass to download all the files required for creating custom firmware. 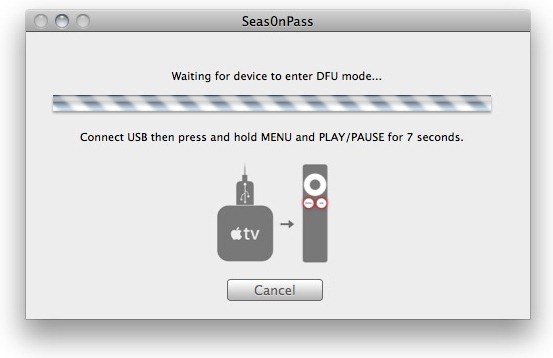 Step 4: When prompted by Seas0nPass, connect your Apple TV using a micro-USB cable (leave power disconnected), and hold-down both the ‘MENU’ and ‘PLAY/PAUSE’ buttons for 7 seven seconds. Step 5: iTunes should now open automatically to start the restore process. Step 6: iTunes will confirm the restore when complete. 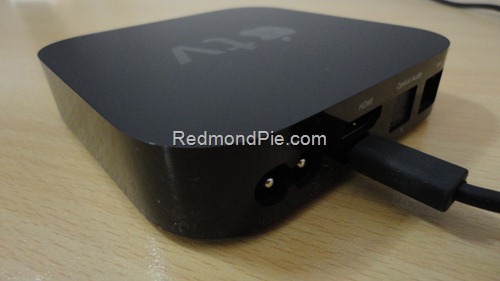 Once done, your Apple TV will be jailbroken on iOS 4.2.1. Since this is a tethered jailbreak, you will have to boot your Apple TV into “tethered-boot” mode for it to function in jailbroken state. 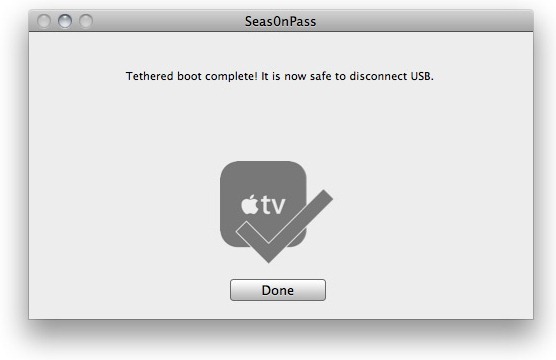 Step 1: Start Seas0nPass again and this time select the ‘Boot Tethered’ option. 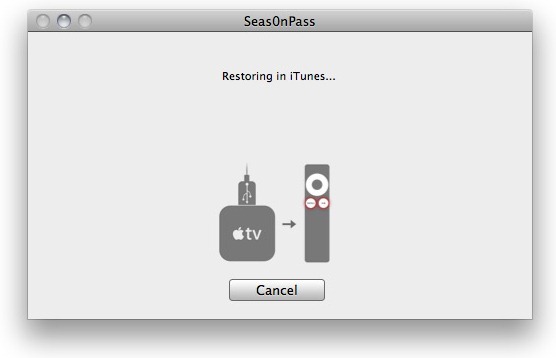 Step 2: When prompted by Seas0nPass, connect the Apple TV to your computer via micro-USB. Wait for the rapid flashing light on Apple TV and then connect the power. Once both are connected, hold-down both the ‘MENU’ and ‘PLAY/PAUSE’ buttons for 7 seven seconds for it to enter DFU mode. Step 3: That’s it ! 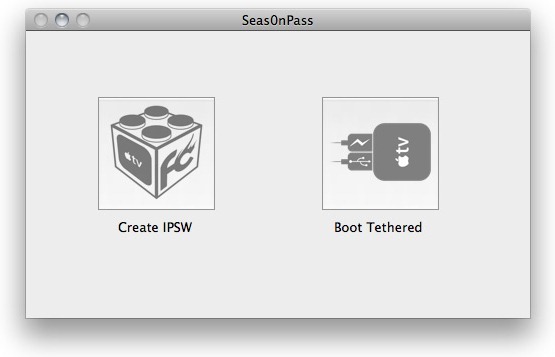 Seas0n Pass will now automatically complete the tethered boot. Once done, remove the micro-USB cable and connect the HDMI cable.